Lead time ranges from 3 weeks to 4 months, depending on the offer selected below. Need it sooner? Check our Quick-Ship Gallery or call (888) 770-7632 (SOFA). Browse all the Stocking Program Leathers for this product above. Click on any image to see the product in your selected leather, and then click the Add to Basket button to purchase with Expedited Shipping at no charge. The Live Small Recliner and Ottoman by Stressless is a great chair with one slight problem. It might be a little too comfortable!. The Live’s heavy padding combine with terrific neck and lunbar support to create an unbeatable seating experience. Endorsed by the American Chiropractic Association, Stressless recliners offer relaxation and reliability in equal doses. There are also 2 different base options available for this model, including the Classic and Signature. The Live is fully customizable in our wide range of Stressless upholsteries. Enter the Design Center now to begin creating the perfect Live Recliner for you and your home. 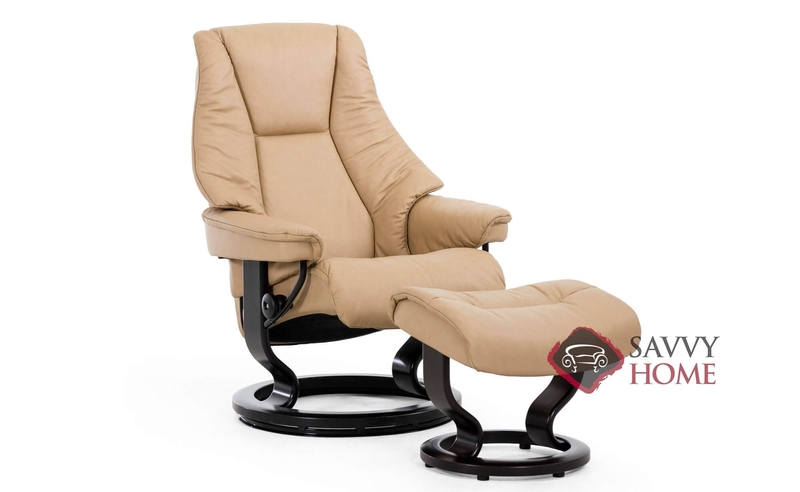 The Live Recliner is also available in Medium and Large sizes. Stressless Recliners are endorsed by the American Chiropractic Association. The matching ottoman shown in images above is included at the sale price. This product is made from 100% genuine top-grain leather. We use top-grain hides--the uppermost, highest quality part of a hide. Our leathers are known to be extremely supple, durable, and gorgeous; a perfect trifecta. Oil-tempered back-springs provide extra support, comfort, and durability to this model. The back springs provide a perfect combination of "give" and resistance. This chair swivels 360 degrees for unmatched comfort and functionality. Just like the banner suggests, this furniture will rock and glide to provide ultimate comfort. This function is either included, or can be added in the Design Center at a minimal cost--after selecting "Customize and Purchase"--under "Additional Options." The core of each recliner, Stressless' Plus System™ provides continuous support for your head and back by simultaneously adjusting the lower support structure along with the headrest. The double-sided mechanism ensures lasting durability and maximum support; so whether you are reclined or upright--there's ample stability. Comfort Zones foam is molded over the structure to provide a unique level of comfort. The perforated foam allows your body to set comfortable into the chair, without losing any lumbar support. 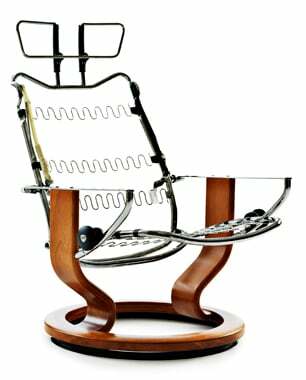 Choose from 7 finishes for the wooden base of your new Stressless Recliner. Everyone likes to relax--and there is no better piece of furniture for this purpose than the recliner. Whether you need a chair, loveseat, sofa or sectional; our reclining furniture is the best place to kick up your feet and relax. This piece is available in a wide variety of leather upholsteries. Click on "Start Customizing" above to go to our Design Center--where you can really build your own sofa! After you choose your favorite leather, you can proceed to view different configuration options, wood finish options, and much more. No purchase or commitment necessary. CLICK to see available accessories! This product does not have any questions. All products 100% guaranteed for pristine condition. Cancel any order within 48 hours for 100% refund. Returns accepted within 10 days of delivery, for full refund less round-trip shipping costs. We reserve the right to replace or repair components or full items, to complete delivery with 100% satisfaction.